VoIP (Voice over Internet Protocol) is allowing users to enjoy low cost untimed connection with their phone calls via broadband. VoIP technology converts analog audio signals into packets of digital data which are transmitted via the Internet and subsequently reassembled and converted back to sound at the receiving end. Consequently, using some of the available free VoIP software, an Internet connection, preferably Broadband, can be used to place free phone calls, bypassing the phone company entirely. Having an IP address, a VoIP device can send and receive digital data packets. Stores the location of every IP device on the Network. Call requests are forwarded to the Call Manager which links to the recipient, dropping out of the packet flow when the call has been accepted. This allows the call to connect using the quickest path. Prioritize voice packets through bottlenecks to avoid packet loss and the resulting fragmented sound. VoIP Phones resemble standard phones, but use an Ethernet connector instead of the usual phone connectors to connect directly to a router. VoIP telephones have the necessary hardware and software installed. An Analog Telephone Adaptor (ATA) allows VoIP use via a standard phone by converting the analogue signal to digital. To make VoIP calls, plug the cable which usually goes to the wall socket into the ATA instead. The ATA is then plugged into a computer or Internet connection. A microphone and speakers, a soundcard and software, plus an Internet connection, preferably high speed broadband, allow VoIP calls using a PC. The only costs usually associated with PC VoIP calls are the ISP charges. X-on VoIP offers voicemail, messaging, virtual switchboard/centrex, non-geographic phone numbers and online administration, delivering these services at a level expected from a company supplying the upper echelons of the UK retail and service sectors. VoIP can suffer from quality issues due to a variety of network based reasons. In order that X-on provide the highest quality VoIP available some requirements need to be met. 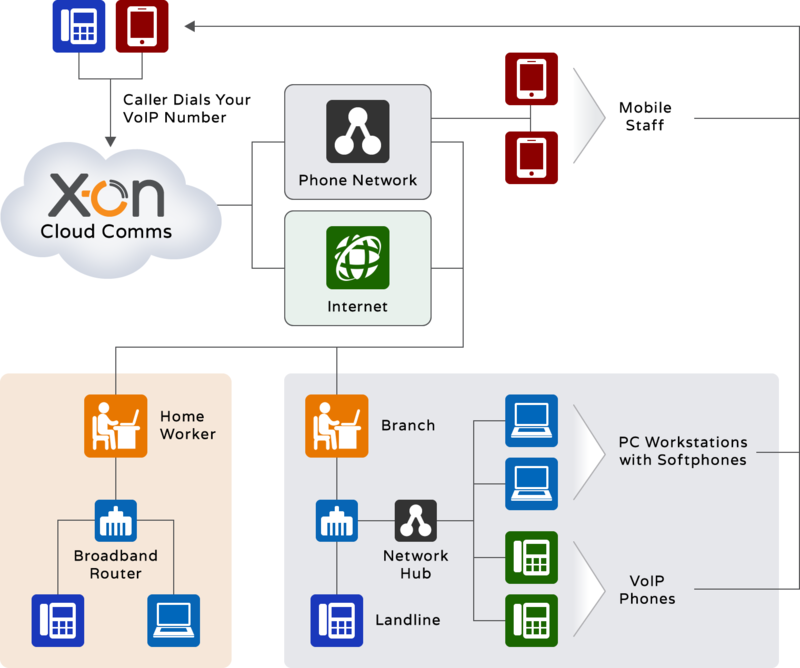 For further information on X-on VoIP and how it can benefit your business with cost savings please call Sales on 0333 332 0000.